THE LATEST ENGLISH PREMIER LEAGUE NEWS – Liverpool continued their recovery from a poor league start by clinching a Premier League victory over visitors Wigan Athletic 3-0 at Anfield. Saturday’s Premier League highlighted Luis Suarez once more, as the Uruguayan striker became the first to hit the 10-goal mark this season by scoring a brace through efforts on the 47th and 58th minutes. Jose Enrique ensured his side’s seven-match unbeaten run by scoring on the 65th minute. 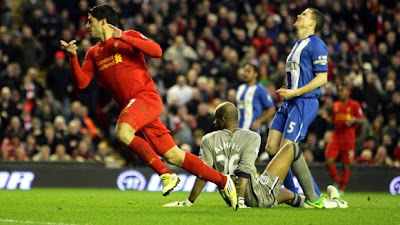 Suarez’ fantastic effort to lead his side to win w1th ease in the match gave him a standing ovation from the home crowd.